Sponsored by the BRASS Education Committee. Offers broad coverage of the hospitality industry. Moving beyond just restaurants and hotels, it includes new growth areas such as event management, meeting planning, cruising, theme parks, attractions and entertainment. Covers Hospitality technology systems, Reservation systems, Rooms management and guest accounting applications, Property management interfaces, Point-of-sale technology, Food and beverage management applications, Sales and catering applications, Accounting applications and security maintenance. 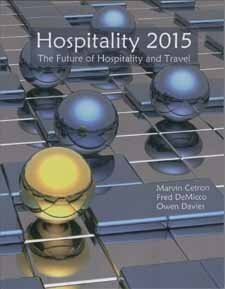 Provides readers with a real-world perspective on the world of hospitality marketing, with industry forms and practical ideas for increasing sales and making marketing more effective. Includes discussions of understanding consumer needs and how to select the best marketing tools to reach consumers. Two futurists and a hospitality educator offer a primer of business forecasting, then apply their methods to predict the future of sectors from restaurants to tourism, airlines to meetings and expositions. Must-have information for anyone pursuing a hospitality career. The hospitality industry may be defined in narrower or broader terms to include lodging, foodservice, casinos, resorts, theme parks, and/or travel and tourism. Use the resources below to learn more about the various sub-industries in the Hospitality sector. Largely a directory of suppliers for the hospitality industry, this site also includes industry links with information and news. A comprehensive site including industry news, free market reports, information on professional associations, and much more. A very valuable site to explore! The website for the publication, Travel+Leisure, this resource contains articles, directories and descriptions for hotels, destinations and restaurants, and lists for the World's Best Awards, which rate the best hotels, restaurants, cities, and travel agents. These are recommended databases for researching the hospitality industry. The links go to vendors' websites. This collection contains full text for nearly 560 publications, including periodicals, company & country reports, and books. Full-text periodicals include Journal of Hospitality & Tourism Education, Hosteur, Asia Pacific Journal of Tourism Research, Current Issues in Tourism, International Journal of Tourism Research, Journal of Sustainable Tourism, Leisure Sciences, Nation's Restaurant News, Restaurant Business and many more. Subjects covered include culinary arts, development & investment, food & beverage management, hospitality law, hotel management, leisure & business travel, market trends, technology and more. Market research reports for products, markets and demographics. Analysis includes market sizes and forecasts, market trends, market segmentation, competitive context, broken down segment performances, retail channels, consumer demographics and survey results, leading companies, brand share, marketing strategies, and more. Contains numerous U.S. and international hotel and hospitality reports. Hotels- US, International Hotel Industry, Boutique Hotels in the US, Hotel Technology International, The Middle Eastern Hotel sector, Hotels in China, The Caribbean Hotel Sector, Indian Luxury Hotel Sector, Casino Hotels, and more. Excellent resource for international industries, countries, markets, and products. Market research reports, statistics, and analyst reports cover consumer market sizes, country market data, forecasts, consumer lifestyles, companies and brands, and many product & location specific reports are related to the hospitality industry. Includes company profiles on key hotel companies; statistics on market sizes, company shares, and brand shares in various countries; and market research reports analyzing a variety of different aspects and trends in the hotel industry. Analyzes consumer expenditures on travel and lodging in the US and internationally. Analysis articles provide research and insight into consumer travel preferences and spending habits. Content on this site is licensed under a CC BY 4.0 Creative Commons Attribution 4.0 International license. BRASS acknowledges Springshare's generous support in hosting the BRASS Business Guides.